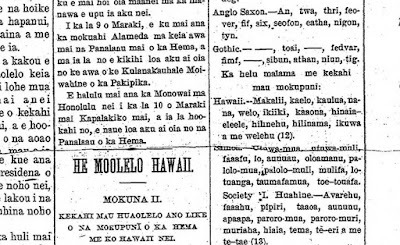 Image description: Excerpt from Nupepa Puka La Kuokoa, February 23, 1893, showing various ways to count to 10, including Old English, Welsh, Gothic, Greek, and Latin. The Pacific venue is ideal for gaining a broader understanding of our field precisely because Hawaiʻi is not Anglo-Saxon England: viewing our research from halfway around the world puts Anglo-Saxon studies in perspective, looking from the outside in—and potentially inside out. In particular, a global and comparative view suggests new ways of thinking about the relationship between past and present and the role that English language, history, and culture play on a world stage. The program boasts that there are over seventy presentations, some of which focus on “applying global and comparative perspectives to the study of Anglo-Saxon England,” as well as more field-specific approaches. The conference program is adorned with what looks like a photo of the Hokule‘a, the contemporary reconstruction of a wa‘a kaulua, the Polynesian voyaging canoe associated with the disappearance of the kanaka maoli big wave surfer, Eddie Aikau. It liberally uses ‘olelo Hawai‘i (Hawaiian language) in phrases such as “Aloha e kakou,” and boasts tours of Hawaiian kingdom sites in Honolulu, a tour of Bishop Museum, and a touristy luau. I also imagine that the conference attendees will also muse about Hawaiian food, especially poi, which they will all be obliged to “try” to get a sense of “authentic” Hawaiian food, which, of course, must taste bad. The thing that strikes one the most is absolutely how white this conference is. With the exception of a couple of East Asian scholars, virtually the entire roster of papers is from white scholars. Of course, there are many scholars involved who I absolutely admire, including one of the keynote speakers. And a brief overview of the topics is unimaginably predictable: “Patristic Number Symbolism in Anglo-Saxon England,” “Repton Revisited: The significance of 873 A.D.,” “The Old English Prefix Ge- and the Structure of the Dictionary of Old English.” This is pretty much standard fare for any K’zoo panel, or Old English special session at the MLA. There is no need to go to the most militarized, colonial space in the US to present on the finer points of problems in Old English lexicography. In full disclosure, I applied to present a paper at this conference, but my paper was rejected. 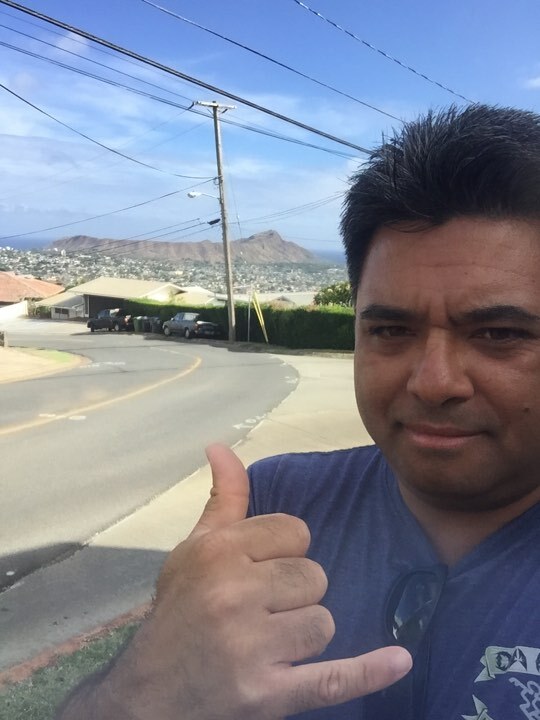 I’d also like to disclose that I’m from Hawai‘i, and I am a medievalist who is a product of the multiethnic mix of Asian and Polynesian peoples and cultures of the islands. The paper I proposed was called “Beowulf and its Others: Sovereignty, Race, and Medieval Settler-Colonialism,” which considered Grendel as an indigenous person with a specific biopolitics, and linked a non-European reading of Beowulf to the contemporary issues of white supremacy that plague Anglo-Saxon studies, and medieval studies more broadly. Allen Frantzen’s anti-feminist and misogynist blog has shaken Old English studies; Rachel Fulton Brown’s defense of Milo Yiannopoulos and her blog and columns for Breitbart has brought awareness to white supremacy in medieval studies; Richard Spencer’s white supremacist “alt-right” fascism trades on settler-colonial ideologies rooted in modern understandings of the Middle Ages and specifically about modern “Anglo-Saxon” identity. In all of these discussions about right-wing political thought inside of our own field of medieval studies, not a single paper in this conference explicitly addresses these developments. And the only paper to actually deal with anything Polynesian in relation to Anglo-Saxon studies is a paper from a white man from New Jersey, replicating the worst possible legacy of colonial representation of kanaka maoli from America’s colonial history. We thought we were past that; but then again, we live in the age of Disney’s Moana and Aulani Resort in Ko ‘Olina, where Hawaiian culture can be commodified and repackaged in a less threatening and fully domesticated manner. This conference practices what is known in indigenous studies as “erasure of the native.” In the conference materials, we are given the image of the “presence” of native identities – from the Hokule‘a picture to the liberal use of ‘olelo Hawai‘i as welcoming phrases. Yet, native voices are noticeably absent from the conference program, except for Uluwehi Hopkins, who will present on Hawaiian sea navigation. This racist understanding of the term “Anglo-Saxon” as defining white Anglo-Americans has a long history in the South Pacific as part of the settler colonial landscape in places such as Hawai‘i, Aotearoa (New Zealand), and Australia. Of course, French settler colonialism in Tahiti is not far from this mark. When I was finishing my Ph.D., a friend of mine in Nebraska, an early modernist, asked me about the best books to use to teach Old English. She had been participating in a prison literacy program and said that several of her incarcerated students wanted to learn Old English. Surprised, I asked her for the background of why they wanted to learn Old English. Saying that there was an unsavory reason, she related that these inmates were part of an Aryan Nation prison gang who had built up a religion around the heroic poem Beowulf called “Theodism.” Old English, as one blog post notes, has an “image problem.” But it goes beyond simply an “image problem.” It goes right to the core of settler-colonial, white supremacist ideology. As I said earlier, the colonialist Anglo-Saxon conference taking place in Hawai‘i will have no understanding about how the term “Anglo-Saxon” is understood in the south Pacific. 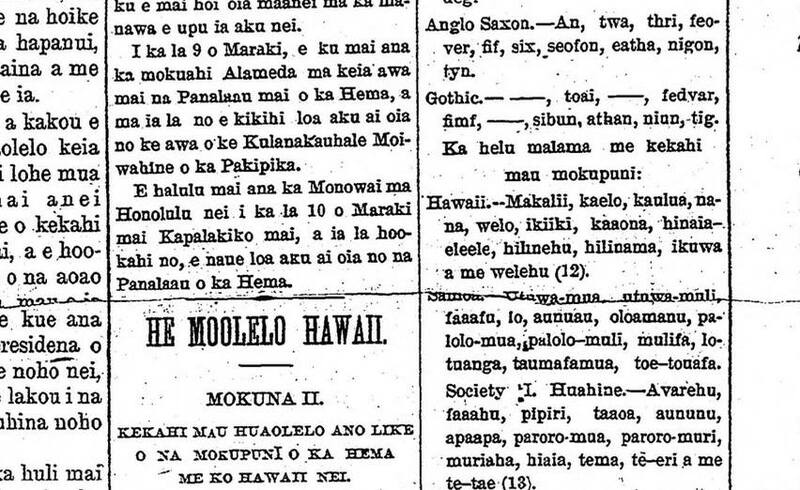 Recently, in a post in the Facebook group Aha Aloha ‘Aina, an image of a Hawaiian phrasebook from 1906 illustrates the power of colonialism in the islands (reproduced below). The image is of derogatory and inflammatory insults to Hawaiian people in both olelo Hawai’i and English, including “Lazy people cannot be trusted;” “They lie in wait to pilfer while folks are asleep or at church;” and “When he thinks, it is of evil.” After the overthrow of the last legitimate government of Hawai‘i, the US took policy of cultural and linguistic genocide, since the actual genocide had already been underway from the late 18th and early 19th century. ‘Olelo Hawai‘i (Hawaiian language) was banned; students in schools were beaten for speaking Hawaiian. The reason Hawaiian creole English (pidgin) even exists is because of the compulsory language policies of the newly formed territorial American state led by white wealthy sugar barons. 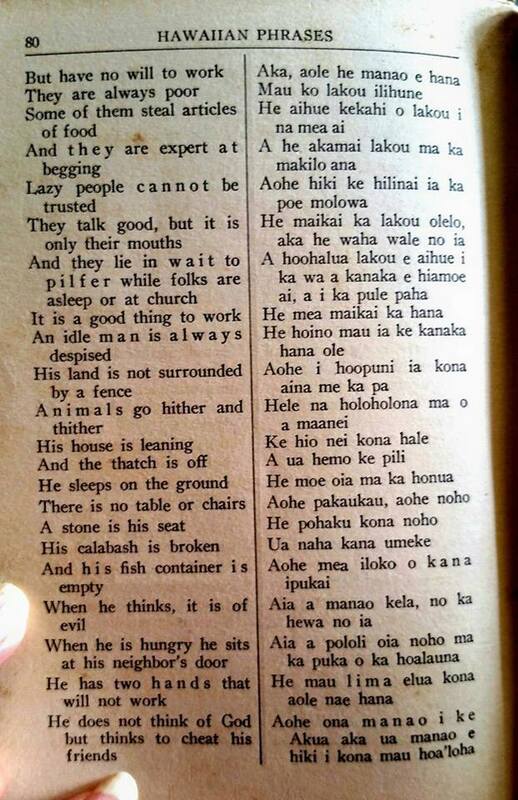 Image description: 1906 phrasebook showing how Hawaiians can insult themselves in English. Until medievalists, and the wider academic world, can decolonize their fields, they will be (unwittingly or not) part of the problem of white supremacy and settler colonialism. In Hawai‘i, this is also true of the sciences, where just yesterday [i.e., July 27, 2017], a judge has allowed the continuation of the building of the Thirty Meter Telescope (TMT) on the summit of Mauna Kea (Mauna a Wakea) on the big island of Hawai‘i. The leaseholder of this land is the University of Hawai‘i, which is itself an institution that participates in the military-industrial complex on the islands – land, sea, and air – and that contribute to the furthering of settler colonial spaces and the continued dispossession of indigenous peoples, the kanaka Maoli. Adam Miyashiro teaches comparative medieval literature at Stockton University in New Jersey. He is a native of Kahalu'u, O'ahu, Hawai'i. He has a PhD in Comparative Literature from Penn State University, and has also taught at Temple University in Philadelphia. He is currently working on a book about race in Mediterranean and European medieval literature. Thank you for this strong and urgent statement, Adam. I'm presenting at the conference and am acutely aware of its exclusions: racial, methodological, and institutional. Anglo-Saxon studies as such is also constituted by a form of geographical/chronological exclusion. The panel I've organized (featuring Mary Kate Hurley and Denis Ferhatović) is intended to open up the field to later and international literary histories. Since we may not have the opportunity to do so in the session itself, I want to note that this move is especially inspired by the work of Elaine Treharne. The field needs to do better, and that means each of us with various kinds of power within it needs to do better. Note from Mary Kate Hurley: These comments were originally posted by Martin Foys, Executive Director of ISAS, on the facebook post that generated this necessary and timely blog post. I am reposting it at his request and with his permission, as well as that of Karen Jolly, the current President of ISAS. Hi Adam - I'm the current Executive Director of ISAS, and I want to thank you first for writing this up and making it clear what the issues are. I've been in contact with Karen Jolly, the University of Hawai'i historian and organizer of the conference, and I should have some more information to provide regarding UH people who are participating in the conference, as she gets it to me. Okay - Anglo-Saxon Studies needs to change in many, many ways. ISAS has traditionally been viewed as (and honestly, in many ways, just "been") part of the old guard in the field, and we've been slowly trying to change things for the better. We're clearly making mistakes along the way, and I expect this will be on ongoing process of improvement. When back in 2012 Karen Jolly proposed hosting our biennial meeting with the theme Global Perspectives on Anglo-Saxons and Anglo-Saxonisms, it was with the expectation that the literally insular field of Anglo-Saxon studies needed to change, and exteriorized - as I understand it from Karen, her goal was to begin to at least try to decolonialize the field from the outside in, by exposing it to other, non-Anglo-Saxon discourses. This has clearly happened imperfectly, and as Executive Director, I offer my apologies for what missteps have occurred in the process of trying to improve. I would also like to invite those who are at UH - whether a part of the conference or not to the Tuesday night session we are sponsoring on Anglo-Saxon Studies and Public Outreach in a Globalised World - a session we added at the request of members specifically to try to further the conversation of how the field needs to change in light of the world around it. This has been a time of exhilarating intellectual and ideological shifts in the academy - but also a time of grave threat and lashbacks to such movements. I personally was moved by Jeffrey J Cohen's recent ITM post about what the pushbacks to all the inexorable change really means - that there is no going back from where we are going, there is no undoing the change that is occurring - and that was an inspiring, epiphanic moment for me. As Executive Director of ISAS, I cannot speak for all of our members, but I can speak for the organization, and where I hope it will continue to move. ISAS does not want to push back, ISAS wishes to learn - and so I thank you again for presenting the opportunity to continue to do so. If it's okay, Adam - I'd also like to reach out to you privately, so I can listen at a bit more length about the concerns voiced here. If you would be open to that, let me know, and I'll send you my cell #. Note from Mary Kate Hurley: These comments were originally posted by Martin Foys, Executive Director of ISAS, on the facebook post that generated this blog post. He posted them there on behalf of Karen Jolly, current president of ISAS. I am reposting here at their request and with their permission. The University of Hawai'i is known for Hawai'i, Pacific, and Asian studies, as well as cultural studies and world history. We don't have a medieval European program at the graduate level, except insofar as medieval and European are seen in a global perspective. Finally, on the website page about Hawai`i - I apologize if it has offended anybody. It was carefully drafted, run by a cultural specialist (Ulu Hopkins), and has specifically chosen hotlinks to resources supportive of Hawaiian sovereignty and addressing colonialism. The recent world voyage of the Hōkūle‘a had the purpose of bringing peace and dialogue globally based on Hawaiian cultural values - we had hoped to begin to do the same with this conference, though there is clearly much more work to be done - and we will continue to do it. I'd just like to add that Karra Shimabukuro has written an excellent blog post, from her own particular background/perspective, that builds upon Adam's post and also offers some additional context for these conversations.